Dinkelland is a municipality in the region of Twente, in Overijssel. It is formed by the towns of Ootmarsum, Denekamp and Weerselo. 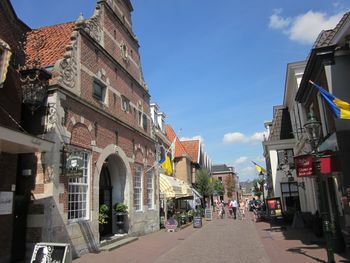 The three towns are very small and provide a truly scenic view of the region of Twente. Main attractions are the medieval town of Ootmarsum, the former monastery Het Stift in Weerselo, and some historical buildings from Denekamp. It is known that Ootmarsum exists at least since the 800s, and the town was named in 917. Ootmarsum was an important city during the Middle Ages, and it gained city rights from the bishop of Utrecht around 1300. The lack of canals and railways excluded Ootmarsum from the industrial development of the region of Twente, as well as preventing it from being targeted by contemporary wars. That would turn Ootmarsum into a town frozen in time. Denekamp was named in 1276, and historically functioned as a rural village. Unlike other towns and villages in the region, Denekamp maintained the Roman catholic faith during the Reform period. To get to Ootmarsum, take bus 64 at either Almelo or Oldenzaal train stations. To get to Denekamp, take bus 62 at Oldenzaal. An one-way trip costs about €2 with an OV-chipkaart, €4 with a paper ticket. From the Oldenzaal train station (where you can rent a bicycle), the distance to Weerselo is about 8 km, to Denekamp 9.5 km and to Ootmarsum 12 km. This page was last edited on 29 July 2012, at 21:27.